Margaret, the daughter of King Bela IV, and Queen Mary Lascaris of Hungary, was offered to God before her birth, in petition that the country would be delivered from the terrible scourge of the Tartars. The prayer having been answered in 1242, the king and queen made good their promise by placing the rich and beautiful three-year-old in the Dominican convent at Vesprim. Here, in company with other children of nobility, she was trained in the arts thought fitting for royalty. Margaret was not content with simply living in the house of God; she demanded the religious habit–and received it–at the age of four. Furthermore, she took upon herself the austerities practiced by the other sisters–fasting, hairshirts, the discipline (scourge), and night vigils. She soon learned the Divine Office by heart and chanted it happily to herself as she went about her play. She chose the least attractive duties of the nuns for herself. She would starve herself to keep her spirit humble. No one but Margaret seemed to take seriously the idea that she would one day make profession and remain as a sister, for it would be of great advantage to her father if she were to make a wise marriage. This question arose seriously when Margaret was 12. She responded in surprise. She said that she had been dedicated to God, even before her birth, and that she intended to remain faithful to that promise. Some years later her father built for her a convent on the island in the Danube between Buda and Pest. 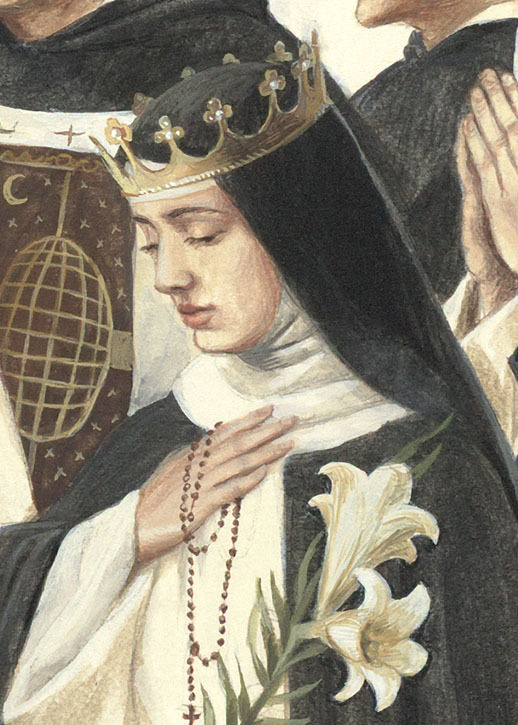 To settle the matter of her vocation, here she pronounced her vows to the master general of the order, Blessed Humbert of the Romans, in 1255, and took the veil in 1261. Again, when Margaret was 18, her father made an attempt to sway her from her purpose, because King Ottokar of Bohemia, hearing of her beauty, had come seeking her hand. He even obtained a dispensation from the pope and approached Margaret with the permission. Margaret replied as she had previously, “I esteem infinitely more the King of Heaven and the inconceivable happiness of possessing Jesus Christ than the crown offered me by the King of Bohemia.” Having established that she was not interested in any throne but a heavenly one, she proceeded with great joy to live an even more fervent religious life than she had before. Margaret’s royal parentage was, of course, a matter of discussion in the convent. But the princess managed to turn such conversation away from herself to the holy lives of the saints who were related to her by blood–King Saint Stephen, Saint Hedwig, Saint Elizabeth of Hungary, and several others. She did not glory in her wealth or parentage, but strove to imitate the saints in their holiness. She took her turn in the kitchen and laundry, seeking by choice much heavy work that her rank might have excused her from doing. She was especially welcome in the infirmary, which proves that she was not a sad-faced saint, and she made it her special duty to care for those who were too disagreeable for anyone else to tend. Margaret’s austerities seem excessive to us of a weaker age. The mysteries of the Passion were very real to her and gave reason for her long fasts, severe scourgings, and other mortifications detailed in the depositions of witnesses taken seven years after her death (of which records are still in existence). Throughout Lent she scarcely ate or slept. She not only imitated the poverty- stricken in their manual labor and hunger, but also in their lack of cleanliness–a form of penance at that time. Some of her acts of self-immolation have been described as “horrifying” and verging on fanaticism, and there seems to have been an element of willfulness in her mortifications. She had a tender devotion to Our Lady, and on the eve of her feasts, Margaret said a thousand Hail Marys. Unable to make the long pilgrimage to the Holy Land, to Rome, or to any of the other famous shrines of Christendom, the saint developed a plan by which she could go in spirit: she counted the miles that lay between herself and the desired shrine, and then said an Ave Maria for every mile there and back. On Good Friday she was so overcome at the thoughts of Our Lord’s Passion that she wept all day. She was frequently in ecstasy, and very embarrassed if anyone found her so and remarked on her holiness. A number of miracles were performed during Margaret’s lifetime and many more after her death because Margaret had an implicit faith in the power and efficacy of prayer. The princess nun was only 28 when she died. Most of the particulars of her life are recorded in existing depositions of witnesses taken in 1277. Her friends and acquaintances petitioned for her to be acclaimed a saint almost immediately after her death. Among them was her own servant, Agnes, who rightly observed that this daughter of a monarch showed far more humility than any of the monastery’s maids. Although their testimony expressed Margaret’s overpowering desire to allow nothing to stand between her and God, the process of canonization was not complete until 1943. The island where her convent stood, called first the “Blessed Virgin’s Isle,” was called “Isle of Margaret” after the saint. She died 18 January 1271 at Budapest, Hungary. Her remains were given to the Poor Clares at Pozsony when the Dominican Order was dissolved, and most of her relics were destroyed in 1789, but portions are still preserved at Gran, Gyor, Pannonhalma. She was beatified on 28 July 1789 by Pope Pius XII.